Sometimes you need a novel that makes you snort with laughter every page or so. One with a great sense of place, good characters, and enough weirdness, softball games, and drunken brawls to keep you engaged. The Flood Girls by Richard Fifield fits the bill. Rachel Flood returns to her hometown in Montana as part of her “making amends” step in Alcoholics Anonymous. The locals don’t exactly welcome her back, including her own mother. The story follows Rachel’s attempts to mend fences, as well as the ups and downs of the characters in her periphery–Jake, the gay boy next door, and her mother, Laverna. The pace is leisurely and the characters are quirky and fun. Everyone drinks and fights and swears, but there are great steady friendships here, too. Broken and downtrodden and dysfunctional as they are, the people of Quinn rely on each other and make spaces for themselves. Hardly anyone is really alone in The Flood Girls. Like the titular softball team, these characters come together and make it work. Mostly. Mostly, because the story takes a very dark and surprising turn very close to the end. I can only speak for myself, but I found it jarring compared to the rest of the book–so much so that I ended up skimming the remainder of the story. Your mileage, of course, may vary. But the rest of the book is so engaging, funny, and heartwarming in a totally bizarre way that it’s worth a read. The Lust Lizard of Melancholy Cove by Christopher Moore might have more sea monsters named Steve than The Flood Girls does, but in lots of other ways they’re quite similar–quirky characters in a small town, their lives and relationships, poignancy in the oddest places, and lots of humor. Mavis, the bar owner in Pine Cove has a lot in common with Laverna, actually. This book also made me think of Joshilyn Jackson, particularly A Grown-Up Kind of Pretty, about a girl’s search for her mother and the strained relationships between three generations of women, told from all three perspectives. The exploration of relationships in all their not-so-great glory, the strong women, as well as the sense of place, might appeal to those who liked The Flood Girls. You might also enjoy The Good House by Ann Leary, if you enjoy Rachel and Laverna in this book, and the way alcoholism is handled with dark humor. The small-town feel is good in that one as well. This is an artistic representation of me. Note all of the books I should have been reading to share with you (background). 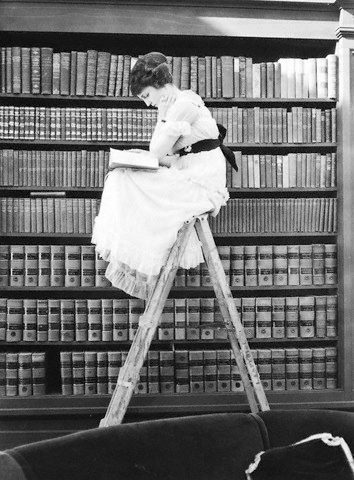 Also, I sold all my chairs to buy books, so I’m sitting on a ladder. I’m sorry to say I had to miss this month’s meeting of Simply Books! I am made even sorrier by the fact that it seems as though it was a dynamic meeting with a few new faces! Many many thanks to Mary Ann, who took wonderful notes in my stead and made this blog post possible.